UPDATE: Online ticket sales close Friday 9/8 at 9PM. Ticket prices increase at the door. Buy online, avoid the lines and save money! 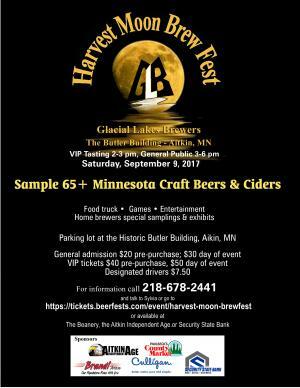 On Saturday, September 9, 2017 come to the 4th annual Harvest Moon Brewfest. VIP tasting 2-3 pm and general public 3-6 pm. 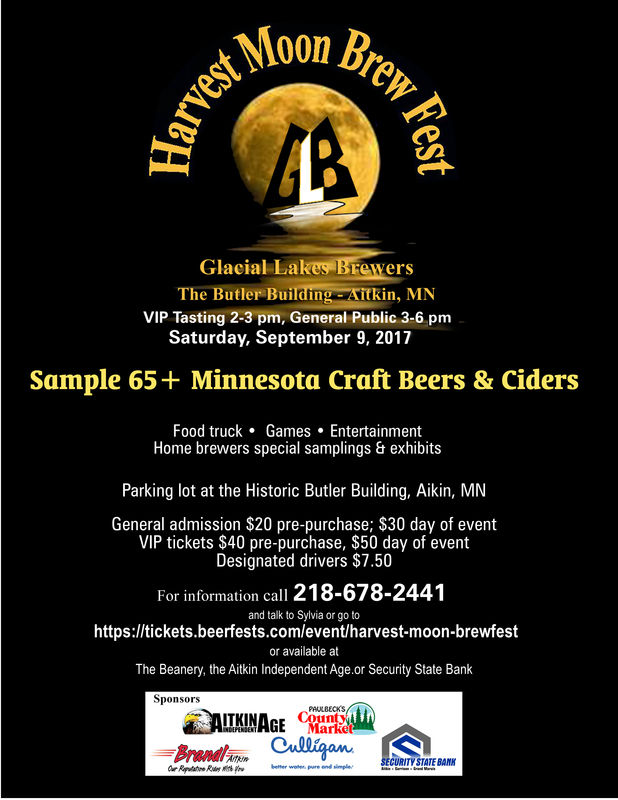 Sample wonderful craft beers from 10 breweries plus great tasting home brews from the Glacial Lakes Home Brewers, have some great food and enjoy a fun day in Aitkin! The VIP tickets are $40 pre-purchase and $50 day of the event; general admission pre-purchase $20 or $30 at the gate. Designated drivers this year are $7.50 and they receive a designated driver mug sponsored by Brandl Motors. This highly successful event is sponsored by Security State Bank, Paulbeck's Country Market, Culligan Water, and Aitkin Age.